• Τhe third joint Passing Exercise (PASSEX) for this year, titled «CYP/FRA-03/2019» carried out in a very successful way, on the 5th of April 2019. between Cyprus Naval Forces (OPV IOANNIDES and the Auxiliary Ship ALASIA) and the French Destroyer FS PROVENCE D-652. Specifically, after the departure of the French Destroyer from Larnaca Port a simulated compliant Cross-Boarding/VBSS exercise, executed at sea, by the OPV IOANNIDES boarding team onboard the FS PROVENCE whilst the French team of the Destroyer, concurrently performed a similar drill onboard the Auxiliary Ship ALASIA. These exercises were of a great value to the personnel as both boarding teams exposed to various operating procedures. On the same day, the 5th of April 2019, the Fast Patrol Boats TSOMAKIS, GEORGIOU and AMMOCHOSTOS took part in a Search and Rescue Exercise with the French Destroyer FS FORBIN and her organic helicopter, and, also a helicopter of the Cyprus Police Aviation Unit, under the coordination and operational control of the JRCC. The SAREX performed within an exercise area south of the Limassol Bay. This sort of cooperation and mutual training of the Cyprus and French Navies, provided their personnel with an excellent opportunity to execute, once more, a fruitful and beneficial training on various maritime issues of common interest, as they both operate in the Eastern Mediterranean. 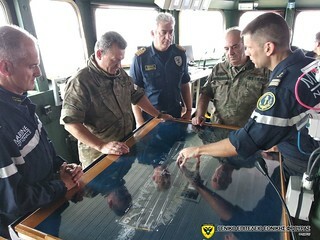 On the 7th of April the Chief of National Guard Lieutenant General Ilias LEONTARIS, accompanied by Deputy Chief of NG Lieutenant General Kostas Chrisiliou and Commander of Navy Command Captain Charalampos Charalampous, paid a courtesy visit to Charles de Gaulle being afloat South of Cyprus. During the visit, Chief of NG and his delegation were briefed about the capabilities and missions of CDG, followed by a tour through the facilities of the aircraft carrier. They were also given the opportunity to observe the execution of procedures concerning the preparation of fighter jets for launching, service and maintenance of aircrafts, and daily routine works of the staff.